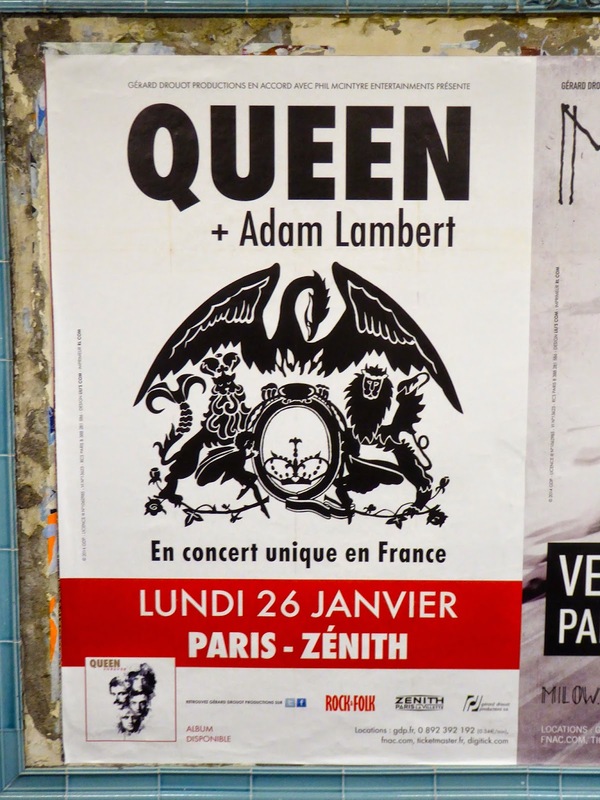 The Travelin' Lundburys: SATURDAY AND SUNDAY IN PARIS----BRRRRR! This weekend has been a bit chilly, by far the coldest days of our trip so far. We have settled in nicely into our new apartment in Paris. We love the apartment, but we much preferred the neighborhood around our original place. It was on Rue des Martyrs in Montmartre, which is a nice area filled with lots of restaurants and shops, and not too touristy. Our new apartment is on a mostly residential street that's not very interesting. To be fair, we haven't explored much at all, as we've stayed pretty busy visiting other areas. If we were going to be here longer, I'm sure we'd poke around a bit more and find some gems. We haven't even found a local bakery--that's serious! Saturday was not our best day in Paris. It was very blustery and raining. Not the best strolling around weather. We know our time here is coming to a close, and we needed to shop for a few gifts to take home. David also wanted to pick up a hoody sweatshirt, as he's been a bit chilly in the evenings. We headed for the very touristy Latin Quarter and "ran the gauntlet" of gift shops and restaurant hawkers on Rue de Hachette. David did find his sweatshirt, and we picked up a few reasonably priced gifts for friends. We walked across the Seine to look for a nice, warm little bistro for a leisurely lunch. We thought maybe the area around Hotel de Ville or BHV would be a likely spot--but didn't find anything. Somehow we got off track, and ended up in the Les Halles area, and wandered around for BLOCKS, not finding anything that looked promising. It's not that we are that picky, but we really didn't want fast/junk/ethnic food. Finally, after about an hour, we agreed that we were driving ourselves crazy, and happened on a small semi-ok cafe. It looked familiar, and sure enough it was the same spot we'd eaten at last week after our visit to The Pompidou. At that point, we really didn't care what we ate--we just wanted out of the weather! We had exactly the same lunch as before--a bowl of onion soup, a shared cheese plate and a carafe of wine. It was fine……….. I wanted to take a look around the big BHV department store near Hotel de Ville, so we walked back over that way. It was mobbed! Our first stop was les toilettes--and that just did me in! The line for the women's snaked through the lingerie department. I waited (not so) patiently, and by the time I met back up with David, I was certainly out of the mood for shopping. I confess that I wasn't the loveliest travel partner on Saturday! So we hopped on the Metro, made a quick stop at a Monoprix for a couple of necessities, and spent the evening just relaxing in our apartment. We had leftovers for dinner and enjoyed a glass of wine. Early to bed for us--I was worn out and crabby! Even though Sunday was VERY cold and windy, it was a much better travel day for us. We formulated a loose plan for the day, mapping out our Metro routes and consulting our Paris Pratique map book. We were on a mission for find some French lentils du Puy, as we have really enjoyed the lentil dishes we've had here in Paris. I've read conflicting reports--some say they are the same as what we can buy at home, and others (notably American David Libovitz, a food blogger and author now living in Paris) say the lentils grown in the volcanic soil in the Puy region of France have a very distinctive flavor. 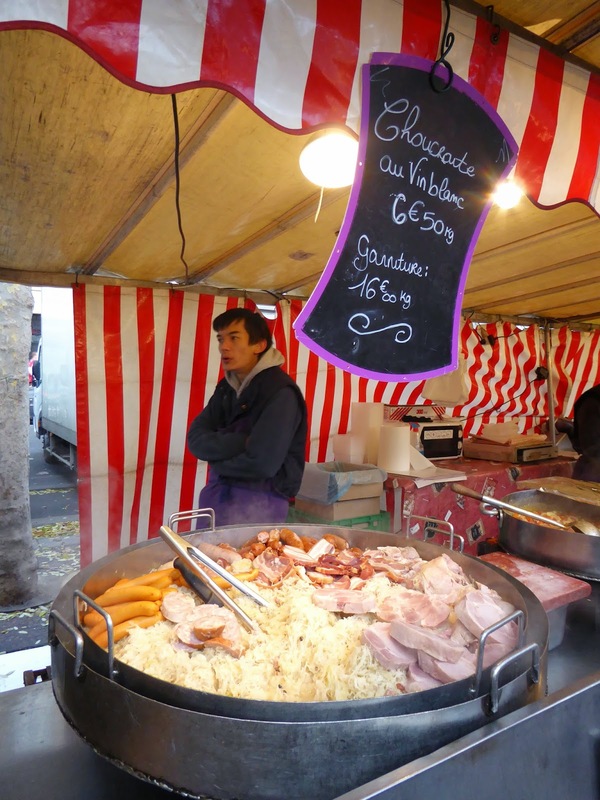 We thought some of the wonderful street markets in Paris might be a likely spot to find them, so I made a list of the markets happening on Sunday, and off we went. 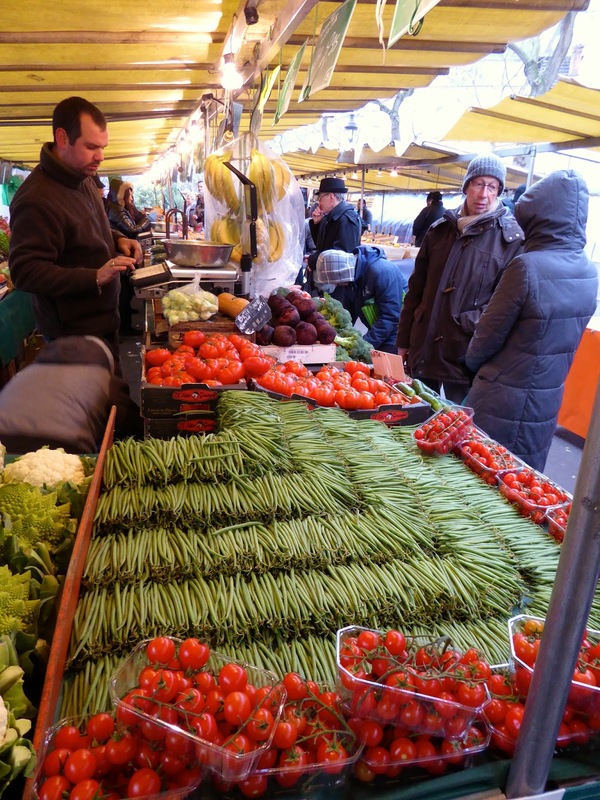 Our first stop was the Bastille market--and it was wonderful! I wish we'd found this one at the beginning of our stay instead of the end. I think we'd have done most of our grocery shopping there instead of Carrefour! Just look at these haricot verts! So perfect…….. Most of the fish at the several fish mongers looked very, very fresh. But this pale salmon would just not do for us spoiled Alaskans. We're used to the BEST wild caught Kenai River reds. David spotted some baguettes aux lardons at this booth, and he couldn't resist. It was yummy! This choucroute looked good to me--probably because it was hot! These tomatoes are such a beautiful rich red--I wonder if they taste as good as they look? At every market we've noticed an abundance of big, beautiful perfect leeks. I've also noticed them peeking out of many shopping carts--they're very popular here. It's not something I use often at home, maybe I'll have to change my ways. There were a few flower vendors; I'm surprised the flowers weren't freezing, I sure was! We did find our lentils at the Bastille Market, we bought almost 3 kilos of them! We are trying two different kinds--regular tiny, dark green French lentils, and some grown in the Puy region--we'll do our own taste test at home! And last, but not least--look at these delicious poulet roti---mmmmmm they smelled so good! Notice the little potatoes in the lower left of the case. 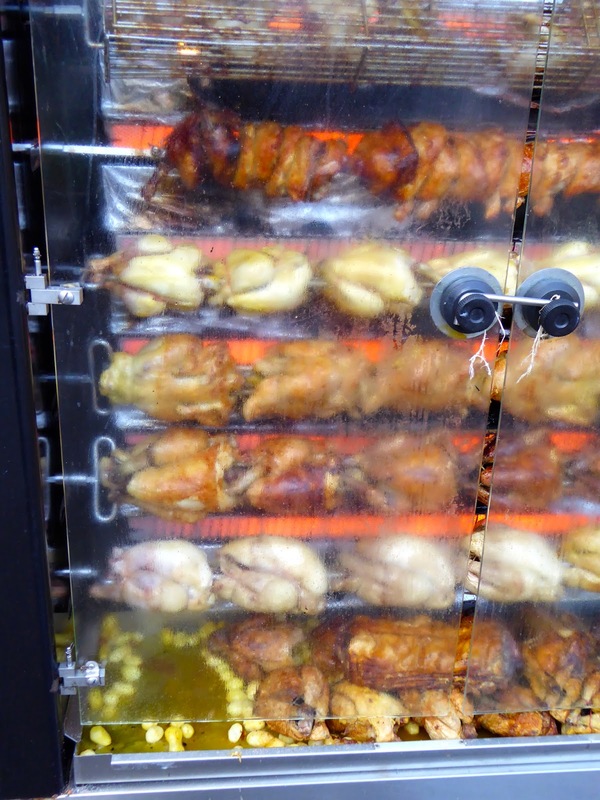 They roast them in the dripping chicken fat--sooo good, but probably so NOT healthy! 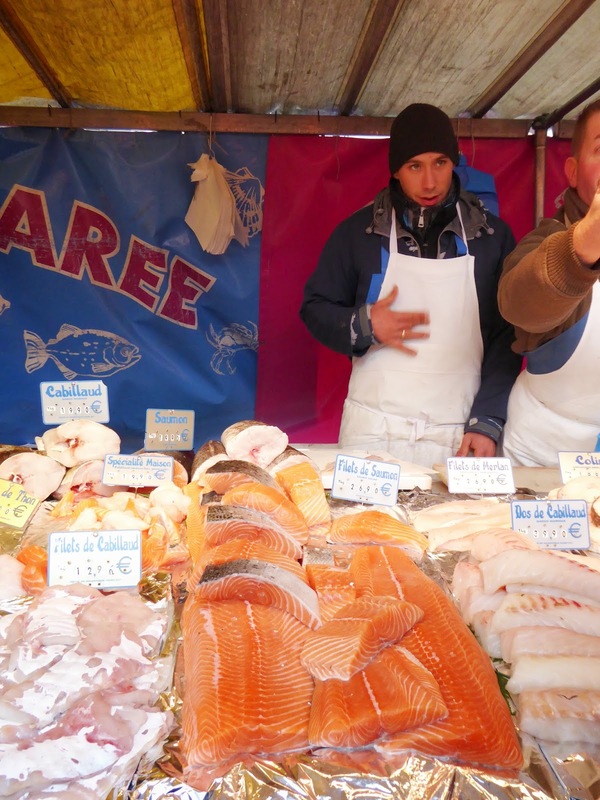 On our list was another visit to the Marche Aligre. Our first visit there this trip it was pouring rain, and the antique/junque vendors were packing up. I love a good look around a junque market, and David patiently wandered around with me for a half an hour or so. Then he decided he needed to check out the nearby (warm!) Monoprix, where he roamed the isles while I finished my browsing and poking around. I found a few little treasures, and successfully bargained for a couple of small old tins and a great basket covered bottle. Despite the fact that I was wearing every layer of clothing I brought, AND we were using those little hand warmers, we were seriously frozen by now! Before we headed to the Metro, we decided to stop in a little cafe to warm up. A couple of vin chaud did the job quite nicely! Our plan was to go to the Bon Marche and check out their Christmas window display. We easily found our way on the Metro, and popped up right across the street from the store. We weren't too impressed with their windows, they're cute, but certainly not as grand as Galleries LaFayette or Printemps. The Bon department store was actually closed, but their Epicerie was open, so we checked it out. They have a wonderful wine selection on the lower floor--wow! We enjoyed a look around, but didn't buy a thing. By now we were ready for lunch, and we'd thought this area would great for finding very nice restaurants. Hmmmmm--not much open on Sunday. We walked around a block or two, and then decided we didn't want a repeat of yesterdays fiasco! We Metro'd back to our old neighborhood and re-visited one of our old standbys. Nothing exciting, just good food. Confit de canard for David and a small steak for me and of course a carafe of wine. On our way home, we saw this poster in the Metro. I'd buy tickets if we were going to be here, I'm sure it will be a fun concert! Monday in Paris? We plan on a trip to Musee des Arts Forain. It's a collection of old fairground and carnival rides and game from the1800's to early 1900's. It's housed in an old wine warehouse in the outskirts of Paris, and is only open to the public (without an appointment for a guided large group tour--offered in French only) for one week between Christmas and New Years. Tomorrow is our lucky day! Beautiful markets. Hope you are having fun. Will miss you for the Fiesta Bowl - BSU and Arizona. Enjoy, enjoy Paris. It's suppose to get real cold here. Tomorrow some friends and I are having a big crab bash for New Years. Happy New Years my friends. Miss you.